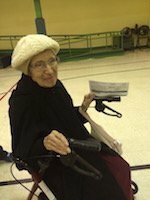 It’s taken awhile to get my post-election perspective out— not because I didn’t have one, but because I was involved in the process of moving mom-in-law to assisted living. Anyone who has helped an elder move, knows that it’s a negotiation rife with emotional upheaval as well as physical and mental logistics. Mom-in-law was a fervent Hillary supporter; the election results dovetailed with her acceptance that it was time to move. She used to watch news continually, yet she has not turned on a television since November 8, 2016. My concern about the US election centered on the inevitability of irrevocable change and yes, revolution. The USA approaches its Pluto Return, which means that we are preparing for overhaul as we did in the 1770s. Unrest and divisions seem to increase. Since supportive planetary configurations buoyed Clinton up, the traditional forecast outcome indicated a win. However, I had seen one candidate with good timing lose (Bush Sr), so I was reserved in my declaration. Let’s face it, to be president sets one up for continual attack. The best thing for Clinton might well have been to lose. As far as what is best for the country itself? The U.S.A.’s Pluto Return happens in 2022. Slow-moving heavenly bodies mirror a build-up before the absolute hit. Our next president is the architect of our revolution (willingly or unwillingly). Trump is in for difficult transits, which will mirror those for the country. Looking back on my pre-election forecast, I did feel that the vote of women would be heard. Post-election statistics show that significant numbers of white women overlooked Trump’s locker room talk and voted for him. Those I talked to after the election told me they did not believe he was as sexist or racist as he appeared. They felt it was simple showmanship. Their concerns were the 2nd amendment, terrorism and taxes. The upshot of his win is an extreme shift in government. A shift however, is not necessarily a revolution but can certainly lead to one. My dad used to say “nothing is as sure as change”…. and he didn’t know anything about astrology. When I look at the U.S.A. and consider what to anticipate with her Pluto Return, I look to the underbelly of this Cancer nation born on July 4, 1776. What is our weakness as a country? It certainly isn’t the military, in spite of the rhetoric. A country’s weakness goes deeper; it threatens the commitment that her people have to the land and community—its Soul. What is the weakness in the Soul of the U.S.A.? First weakness in the Soul of the U.S.A.: the original settlers thrust themselves on land that was considered sacred to its indigenous people. They “bought” the land (a concept foreign to natives who believed that no one owned the land). For hundreds of years, the U.S. government systematically destroyed tribal life. Until there is a U.S. president and governing bodies willing to make formal atonement for this genocide and wrongful theft, we will never be in full integrity with power. Update 12/52016—The veterans knelt for atonement at Standing Rock. These American people connect with a love and respect for one another in spite of the political rhetoric. 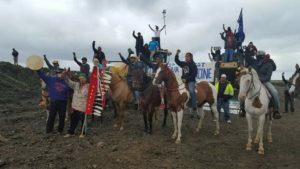 It is no coincidence that tribal nations throughout America now gather to support Standing Rock as the U.S. approaches its Pluto Return. This is unprecedented. Be watchful of the revolutionaries who come together; the more disparate, the greater their ability to transform institutions. There is tremendous healing happening as Americans of many backgrounds, including vets join in solidarity with the Sioux Nation at Standing Rock. The “taxation without representation” that bound people together in the 1770s, may now be a theme about who owns our water and essentially our lives? Do citizens have a say in it? Or do corporate rulers continue to determine how things are done and the people have to pay for it. Second weakness in the Soul of the U.S.A.: the mythology of the U.S.A. is that it is a nation of immigrants, yet the unrest we presently experience comes from an inherent flaw in this story. Immigrants certainly came in large numbers, but aside from tribal nations, many citizens of African descent come from the millions of slaves shipped in for hundreds of years. People who do best in this country succeed financially and/or through education. Yet in spite of the perception by those who cannot see their privilege, the ability to transcend class is not an equal playing field. This is a part of U.S.A. history that needs to be acknowledged by every institution that utilized slavery to its benefit. 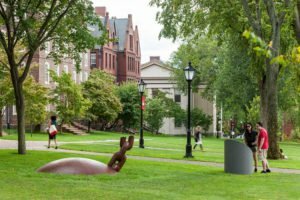 For instance, Brown University installed a sculpture on its grounds by Martin Puryear. The design was to admit that Brown was built on the slave trade, yet this is not part of the tour for perspective students. However, one can read the plaque that explains this fact. Venerable institutions in the U.S. have this past. Only by full disclosure can we hope to heal. 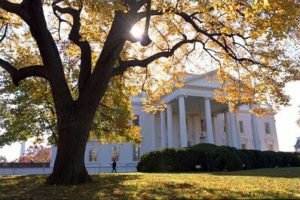 It is not OK that the White House was built by slaves and that there are U.S. citizens who resent the fact that a black family has lived there for eight years. Prejudice is taught. It’s also no coincidence that the Black Lives Matter movement has gained momentum. The planet Neptune is in Pisces, which brings conversations about victimization as well as denial. The “law and order” presidency must address racial profiling and undue use of force if it hopes to calm unrest. One reaction to these two weaknesses in the Soul of the U.S.A. is for the white person to say: “my family came over in the 1900s” or “nobody in my family owned a slave”. But the U.S.A. was born on the 4th of July under the Sun in Cancer. Like it or not, we think of ourselves as a family. At present we are a dysfunctional family. Like a dry drunk, the U.S. postures itself as “holier than thou”. Anyone who has recovered from such a family knows that the authoritarian bluster cannot keep all members in check when they peel back the denial part of the dysfunction. After denial comes acceptance, then the healing begins. 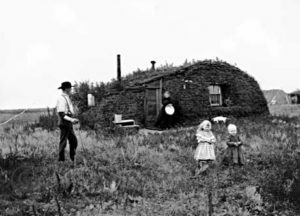 Third weakness in the Soul of the U.S.A.: the belief that a U.S. citizen can live in the town their ancestors did and make a good life for themselves for countless generations. If they can’t, the government failed them. But that family’s origin, unless they are from tribal nations, came from across the sea. Their ancestors came to the New Land because there was no work in the old country. What makes a nation of people who came from immigrants unwilling to create change themselves? They look to their leaders and politicians, instead of the raw material of their creative will. Complacency eats the soul. These weaknesses are up for transformation. Yes, there are more weaknesses in the Soul of the U.S.A. Anyone who has lived through a Pluto transit goes through a terrible upheaval. Yet afterwords: rebirth. Be willing to go through the process, because you don’t get a pass. If you voted for Trump, hold him accountable to the changes he promised. If you really believed he is not racist or sexist but you see his government sanctioning those behaviors, you must speak out. It won’t work to say later that you are surprised; if you don’t speak out, you are complicit with that agenda. Pluto transits bring us to our knees. As Maya Angelou said “when someone shows you who they are, believe them the first time”. If you voted for Hillary, get involved in the causes that matter to you. We cannot expect one person to do the work for an entire nation. Ditto if you went third party. If you didn’t vote remember, complacency eats your soul. We are living in a time of tumultuous passion. If you’ve lost yours, it does good to reflect back on when you last felt it. What stomped it out? Give it some thought. Not only do you deserve a passionate existence, but when you ignite yours, everyone benefits. The only way to strengthen a weakness is to meet it head-on. Denial simply increases vulnerability. I know I only listed 3 weaknesses; there are certainly more. We are not going to magically change them in the next several years, but we will witness irrevocable transitions. Perhaps there’s another weakness in the Soul of the U.S.A. that you can identify is up for transformation? I have been anxiously awaiting your post regarding the post-election picture. Very interesting, yet dark and troubling. I have been profoundly shaken by this election like never before. I still cannot watch the news…ironic since I use to work in the newspaper industry, and I awaken every night around 2-3 am with the thought of Donald Trump and the dark direction he is taking this country. His cabinet selections are horrifying. Your insights make perfect sense and I do believe the sins on soul of this county cannot stay buried…but it seems we are moving away from healing them toward making them more pronounced. I have shared your post with others and they have expressed an interest in signing up to follow your newletter and daily posts. I was hoping for a more detailed picture and explanation of the transits in Trump’s chart for not only 2017, but for the next four years. I hope there will be a serious moment of reckoning for this mentally and spiritually unhealthy soul. Would love to hear the bigger picture regarding his chart. Hope to schedule a private reading with you into the New Year. Thank you for your gift of insight.